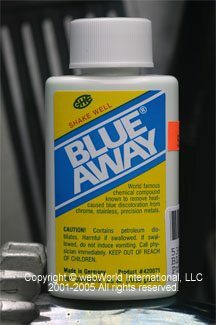 Blue Away “Motorcycle Exhaust Blue Remover Cream” didn’t work very well in this trial. I remember thinking that it seemed like a lot of dosh for an oil filter, a small bottle of Blue Away (2.5 ounces, to be exact) and a 5 gram tube of Simichrome Polish . But I paid the bill and as I was walking out I rummaged through the bag to try and figure out why the bill was so high. As it turned out, the Blue Away bottle was so small that the price tag had to be wrapped around the side. What I thought was $5.95 was actually $15.95! But I figured that if it worked, it would be worth it. 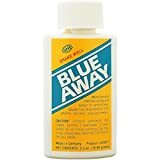 Blue Away has been around since, well, probably since the Neanderthals first noticed their stone exhaust pipes turning blue. I’ve been around just about that long myself, but for some reason, I never got around to trying it, probably because the bikes I owned had many more things to worry about than blue exhaust pipes. Blue Away is made in Germany by Happich, the same company that makes the equally as famous Simichrome polish. Both of these products can be found at just about every motorcycle shop in the world (and now at Blue Away and Bluing Removerscan be purchased at Amazon.com), and they’ve been used by zillions of motorcyclists, I’m sure. Since the ’86 BMW R65 is nearing its twentieth birthday, making it eligible for concours events, I figured I’d give it a treat and polish up the chrome plated exhaust headers. The bike seems to be running hot lately; it has that hot burning smell to it after a ride when I’m backing it into the garage. Both exhaust pipes have become very blue, and it’s especially bad near the heads. Perhaps the bike is running lean? It’s something I’ll have to investigate one of these days, but otherwise it seems to be running fine. In any case, the exhaust on both sides has become very discolored. I figured Blue Away was the perfect solution. Blue Away is blue, as it’s name implies. It feels gritty, so it must have some type of aggressive polishing media blended in. It doesn’t have the ammonia smell of Noxon or other chrome cleaners or polishes; it smells more like a car wax. I followed the instructions, shaking vigorously, and I applied it to the exhaust. The product seems to dry up very quickly as it’s being applied, which leads me to believe that the 2.5 oz. bottle won’t cover a lot of surface area. I rubbed and polished and tried everything I could think of, but the results are very disappointing, to say the least. Perhaps the bluing on the R65’s exhaust is beyond help, but it’s very hard to notice any kind of difference. Sure, the pipes are a bit shinier, but that would be the case with just about any polish rubbed on and buffed out. 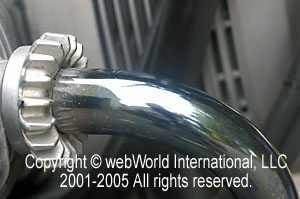 R65 exhaust header, right side, before Blue Away. R65 exhaust header, right side, after Blue Away. 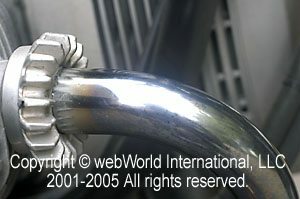 R65 exhaust header, left side, before Blue Away. R65 exhaust header, left side, after Blue Away. As you can see, not much difference. An expensive lesson? Maybe…I’ll save the Blue Away for another bike, another time and see if there’s a difference. From “J.C.” (October 2011): “Good morning folks. Please tell Bill C. that I also had an 86 BMW R65 and tried Blue Away on the exhaust pipes and it did nought. I now mostly o/h earlier BMWs, like the 1960 R 60, etc. I just tried Blue Away again on the aftermarket stainless steel exhaust system on my 1958 R 69 and it did a fairly good job of removing blue and other heat generated discolorations. 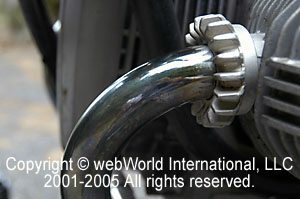 I don’t know what company made this exhaust system, except they are in the UK. Lots of wet rags to apply and lots of clean rags to polish. The powder is probably similar to that used by precision optical engineers; it’s like women’s face powder. Staintune no longer makes systems for these older BMW bikes, so we have to buy from the U.S.A., although there is a company here called Overland in South Africa.